A Chicago teen is facing a first-degree-murder charge after allegedly killing an 89-year-old South Side woman and setting her home on fire, the Chicago Tribune reports. Trae Chatmon, 18, is accused of forcing his way into the home of Josephine Johnson in the early-morning hours of Oct. 26 and hitting her in the head before stabbing her several times. The teen then allegedly ransacked the home before setting the apartment on fire and running away with several stolen items, police told the news site. 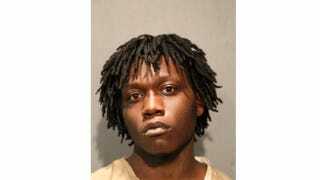 Chatmon was reportedly already in Cook County Jail for another case when the new charge was filed. Johnson's body was discovered by neighbors in the building as smoke spread throughout the buidling. She was found near a door with her body on fire. "She didn't have any enemies," Charles Morris, who lives in a basement apartment, told the Tribune. "I knew Miss Josephine for maybe 15 years. She was a nice lady. She had no children." Chatmon was expected to appear in bond court later Thursday.